Team flux consists of students Yotam Haimberg, Anisha Deshmane, Jason Hsu, and Elwin Lee. Bringing together architecture, electrical engineering, industrial design, and psychology, the team creates physical experiences that explore new areas of entertainment technology. 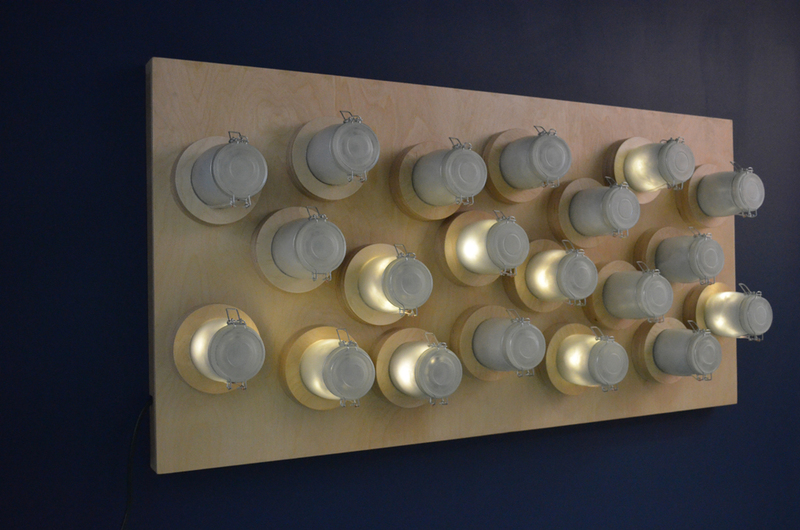 One to One is a wall-mounted installation that consists of jars that capture voices and play them back. 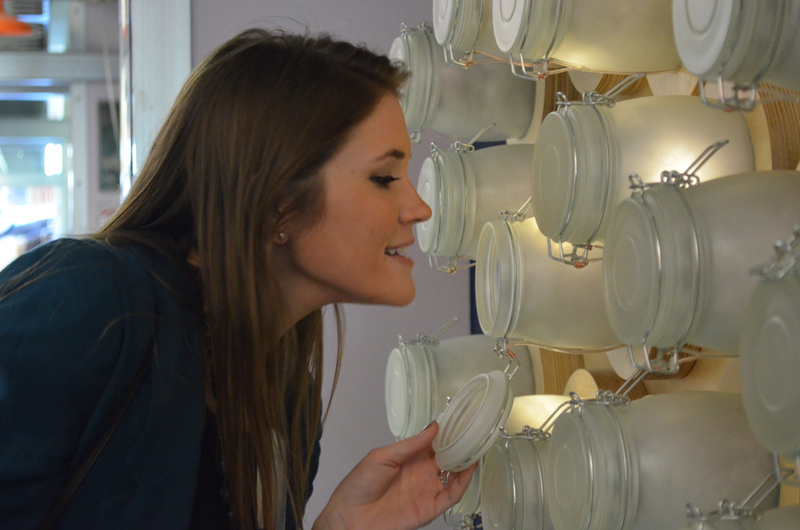 When a jar has a message trapped inside it, the LEDs light up in a twinkling pattern. In order to leave a message, open a jar and speak into it. To release a message, open a lit jar and it will play back before disappearing forever. Created as a reaction to the rise of social isolationism, M_rror removes the individual from their surroundings by refusing to reflect them alone, refocusing their attention on their surroundings. As one approaches the mirror with someone else, it will reflect the connection between the two individuals. 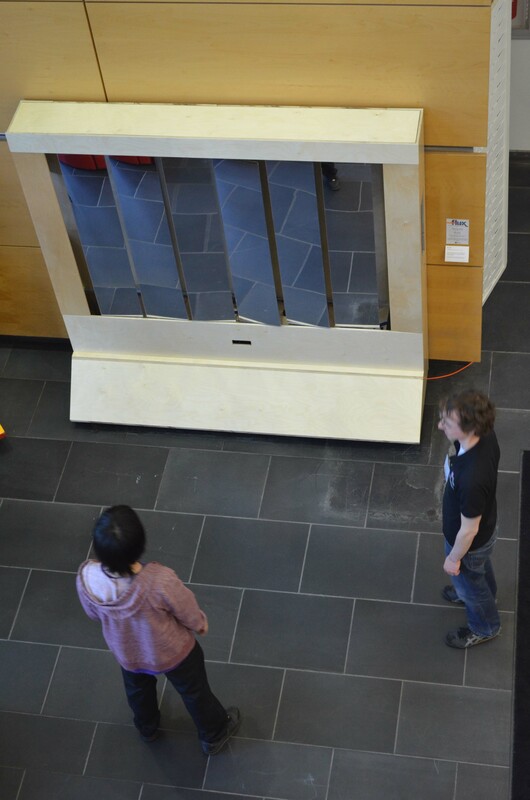 In this installation, a Kinect detects the presence of people in front of the installation and the mirrored panels rotate to avoid the person detected. If multiple people stand in front of the installation together, the mirrors flatten out to behave as a normal mirror. Flux was supported by a grant from the Frank-Ratchye Fund for Art @ the Frontier (FRFAF)— an endowment founded to encourage the creation of innovative artworks by the faculty, students and staff of Carnegie Mellon University. With this fund, the STUDIO seeks to develop a cache of groundbreaking projects created at CMU — works that can be described as “thinking at the edges” of the intersection of disciplines. Yotam Haimberg, Anisha Deshmane, Jason Hsu, and Elwin Lee are students in CMU’s Entertainment Technology Center.